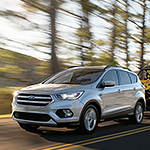 One of the convenience features that you will find on the Ford Escape is the hands-free liftgate. When you have this vehicle's key fob in your pocket, you simply have to place your foot under the rear of the vehicle to get the liftgate to come down. This is especially convenient when you are carrying an armload of groceries. The Ford Escape also provides convenience with the rear sensing system. This system emits beeps as you back up. When you get close to an object while backing, the beeps will become more rapid letting you know when you are too close.